As an English language teacher, I hear questions like these from learners all the time, and as a language learner myself (currently studying Japanese), I’ve even asked them too. Learning and remembering new words is an extremely important part of learning a language, but there’s one big problem: we forget things so easily if we don’t review! The forgetting curve shows how information is lost over time when we don’t review it. 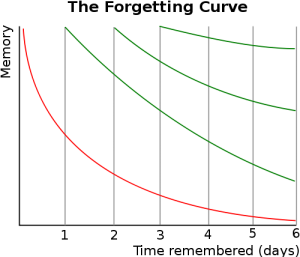 The red line shows that after 6 days, we will have forgotten almost everything we studied, but the green lines show that if we review regularly, it improves how well we remember something. So, how can you review vocabulary regularly to make sure you don’t forget what you’ve learned? Spaced Repetition Software (SRS), like Anki, uses a learning technique that increases the time between reviews of previously learned material in order to exploit the ​spacing effect. To put it simply, you review flashcards in increasing intervals of time. For example: if you try to remember the meaning of the word “influence”, using Anki, you would first review that word and then have the option of re-reviewing it right now, in 10 minutes, or 4 days later (you can customise your preferences). ​Next time you review it, you will have the option to review it a third time thereafter with longer time intervals (for example, 10m, 5d, 9d, or 12d), and so on. Within a few months, this will ensure that the information will stick in your long-term memory. Repeating and reviewing are essential to memorisation. I’ve been using Anki to study Japanese, and it’s helped me to remember hundreds of words and sentences! Anki is free for your computer, and costs around $30 on some smartphones. I highly recommend getting the mobile version because it means that you can study anytime, anywhere. This takes great advantage of dead time. Dead time refers to those small amounts of time throughout the day where you can’t really do anything productive. For example, traveling on a train or sitting and waiting for an appointment. So why don’t you use those times to improve your vocabulary? From my personal experience, it’s fantastic! And it means that when you get home in the evening after your normal daily routine, you don’t need to worry too much about studying, because you’ve already done it! So there you go, a simple method for helping you remember vocabulary. Try it out for yourself, and I hope that it’s useful for your own studies. Make sure you check out my YouTube video on this topic! Nate Ross is is an Online English Teacher. Take a look at his lessons and videos for learners on foreigo.com. You can download his book, “The Five-Step Guide To Fluency” for free here.